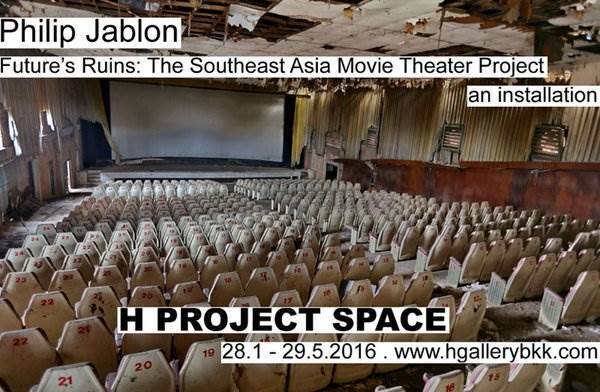 H Project Space is very pleased to announce an installation by Philip Jablon based on his fascinating Southeast Asia Movie Theater Project, on-going photographic documentation of the region’s remaining, and rapidly disappearing, stand-alone movie theaters. Started in 2009, the series is a multivalent account of spaces and structures that shape complex ideas about history, cultural identity and national heritage. Beginning at the turn of the twentieth century and essentially modern in character, Jablon’s images of these now mostly dilapidated sites capture a great sense of Southeast Asia’s conflicted relationship to the historical ideals of modernity. The title, Future’s Ruins, refers to the utopian ambitions of early modernist design and here the buildings are not shells of past failures because modernity remains a desired state in the region; rather, they are signs of a time that hasn’t quite happened or has yet to. The theaters’ ruination and on-going disappearance speaks to flux, confusion, and reinvention for our inevitably uncertain future: the underside of modernism’s international pretensions about a perfected world. Other interests that can be discerned include the theaters’ direct relationship to the variegations of the urban street, unlike today’s antiseptic multiplexes, the cinema as a focus for public and private fantasy and a democratized place where all social classes mix. Some of the buildings have been repurposed or appropriated to serve the newly practical and the queer: from car parks to the farming of edible birds’ nests to sexual hook-up joints. 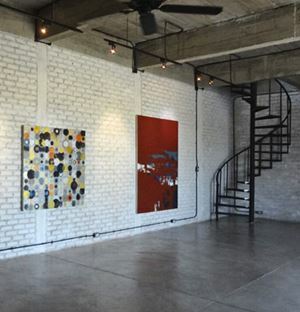 Such layered interest is reflected in the manner of the photographs, which fit no conventional stylistic category. Future’s Ruins is an installation that further explores the experience of Jablon’s photographs through a play with scale and a dialogue with H Gallery’s colonial architecture, condensing time and exploring the curious intimacies and critical grandness of our relationships to history, culture and identity. Moreover, for Jablon, the aggregate effect of documenting the whole of Southeast Asia’s remaining movie theaters is to advocate for select ones. Ones that stand a reasonable chance of being preserved. Philip Jablon is a photographer and researcher based between Thailand and the US. A graduate of Chiang Mai University and Temple University, The Southeast Asia Movie Theater Project documents and advocates for the preservation of Southeast Asia’s remaining stand-alone movie theaters. He has facilitated research projects for grassroots activists across the Greater Mekong Sub-region and is the recipient of a number of major grants.